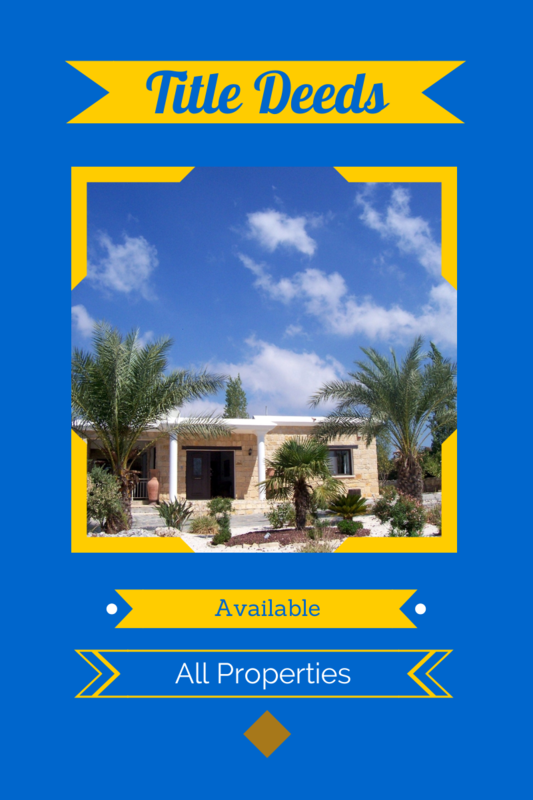 Cyprus Properties with Title Deeds specilaizing in the Paphos District. Originally we created this page to list all the Cyprus properties we had for sale with title deeds, at the time the majority of our property for sale did not have title deeds. Now, the majority of our properties do have title deeds because we do not list without them. As the housing market began to struggle, banks were not allowing mortgages on homes without deeds and the listings were not selling until they had them. We decided that we will no longer list any property on Cyprus101.com that does not have an AX number or Title Deeds. The AX number is a property identification number that signifies that the issuance of the Title Deeds is in it's last stage and they will be available soon. There are many property owners who do not have title deeds and their homes are very modern, well built new homes that should not be completely disregarded. A buyer can find great deals searching for such properties and with the help of a competent attorney all due diligence can ensure that the transfer is safe and in due time the new owner will have the title deeds. However the process can take longer and having cash is necessary. Any property we now list that does not have title deeds as well as all new constructions, land and rentals will be on our sister site - Property Of Cyprus www.propertyofcyprus.com. The Cyprus government is working hard to resolve the title deeds issues. The number of deeds issued in the last year has been a great improvement over recent years. The recently added pressure Cyprus has encountered through the TROIKA, from the struggling housing market and through other media, we are confident the title deeds issue will be part of the past and the system will evolve into a modern day system that will operate just like most modern European countries. If you are buying a property in Cyprus please search through all properties on this site and know that the majority of homes now have title deeds and are clearly labeled as such. Having the deeds means the home is available and transferable without any issues. If you own and want to sell a property in Cyprus that has title deeds and would like to feature it on Cyprus101 then please contact us to get the process moving!